Based in the vision of Temple’s Founder Russell Conwell, to provide working people with opportunities and access to higher education, CSPCD has provided adult literacy learners the skills to aspire to enroll in the university in their “backyard”. CSPCD has always facilitated programs for the hardest to serve populations. A key component in all services, adult literacy, provided the foundational skills necessary to equip vulnerable populations with tools to "face" and overcome their barriers. Since 1971, CSPCD has been involved in adult education programs. The Neighborhood Adult Basic Education program was developed in 1982 to provide literacy to North Philadelphia residents. Pennsylvania Department of Education funding was acquired in 1997 to extend adult basic education services to the North Central Philadelphia area. In 2000, the program was expanded to include technology, and work-based literacy classes to prepare learners in the Philadelphia region. Temple CSPCD offers a myriad of other employment, training, and workforce development programs. Temple WELL expands services and provides the precursor training to help youth and adults obtain the required literacy and math skills and GED to enter post-secondary education and training. CSPCD’s WELL program is also connected to several EARN Centers and CareerLink Centers. WELL staff provides on-site assessment services, adult literacy classes, and promotes the use of distance learning models such as KeyTrain. This experience has provided a foundation for developing an effective full-service, workforce contextualized adult literacy program. We are writing to invite you to the 2017-18 WELL Orientation. Thank you for your continued participation in the WELL Program. We appreciate having you as a student and look forward to helping you achieve your EDUCATIONAL AND CAREER GOALS! Please use this REGISTRATION LINK to choose a date and time for the 2017-18 Orientation Session. Please contact us at 215-204-2560 if you have any questions, or feel free to contact me directly at the number listed below. 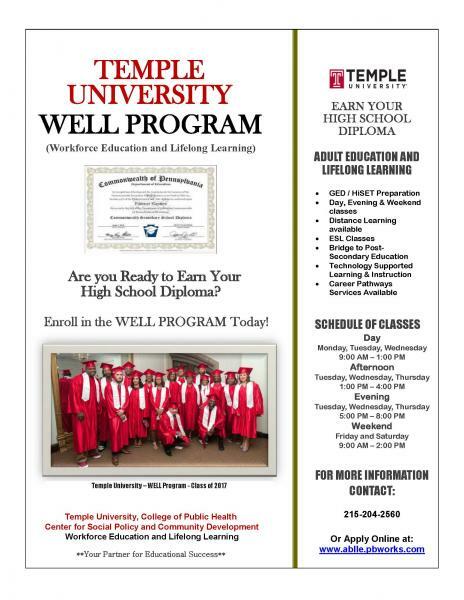 Thank you for your interest in the WELL Program at Temple University. Our FREE adult classes help learners to prepare for the PA Adult Secondary Education Diploma. Our fantastic instructors will develop an individualized learning plan for you, guide and assist with updating your academic skills and help you decide which exam would be best to obtain your diploma. Please review the table below for a complete list of the available examination options. The first step in the enrollment process is to attend an Orientation Session. Click this REGISTRATION LINK to register for one of our sessions. Please contact us at 215-204-2560 if you have any questions, or feel free to contact me directly at the number listed below.